Acupuncture: it is time to stop redundant, foolish, wasteful and unethical pseudo-science. Acupuncture is a branch of alternative medicine where pseudo-science abounds. Here is yet another example of this deplorable phenomenon. This study was conducted to evaluate the efficacy of acupuncture in the management of primary dysmenorrhea. Sixty females aged 17-23 years were randomly assigned to either a study group or a control group. The study group received acupuncture for the duration of 20 minutes/day, for 15 days/month, for the period of 90 days. The control group did not receive acupuncture for the same period. Both groups were assessed on day 1; day 30 and day 60; and day 90. The results showed a significant reduction in all the variables such as the visual analogue scale score for pain, menstrual cramps, headache, dizziness, diarrhoea, faint, mood changes, tiredness, nausea, and vomiting in the study group compared with those in the control group. The authors concluded that acupuncture could be considered as an effective treatment modality for the management of primary dysmenorrhea. 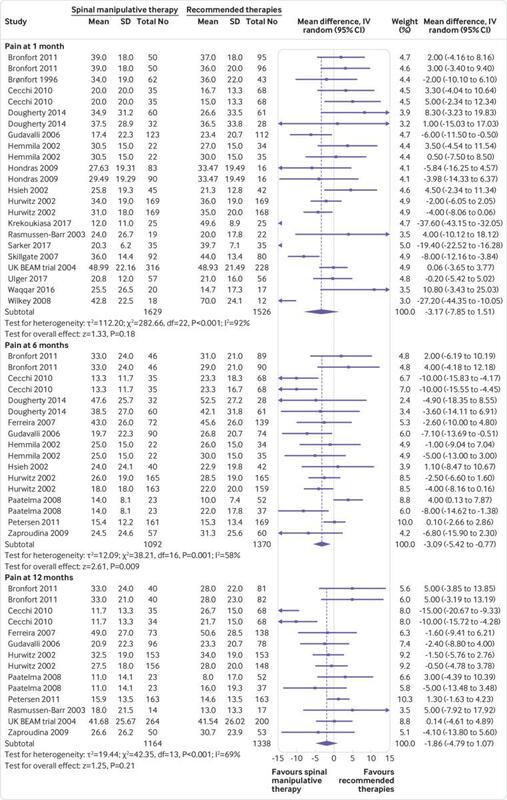 These findings contradict those of a recent Cochrane review (authored by known acupuncture-proponents) which included 42 RCTs and concluded that there is insufficient evidence to demonstrate whether or not acupuncture or acupressure are effective in treating primary dysmenorrhoea, and for most comparisons no data were available on adverse events. The quality of the evidence was low or very low for all comparisons. The main limitations were risk of bias, poor reporting, inconsistency and risk of publication bias. It is high time to stop such redundant, foolish, wasteful and unethical pseudo-science. Can I tempt you to run a little (hopefully instructive) thought-experiment with you? It is quite simple: I will tell you about the design of a clinical trial, and you will tell me what the likely outcome of this study would be. 1. Standard needle acupuncture administered according to a protocol recommended by a team of expert acupuncturists. 2. Minimally invasive sham-acupuncture employing shallow needle insertion using short needles at non-acupuncture points. Patients in groups 1 and 2 are blinded, i. e. they are not supposed to know whether they receive the sham or real acupuncture. 3. No treatment at all. We apply the treatments for a sufficiently long time, say 12 weeks. Before we start, after 6 and 12 weeks, we measure our patients’ pain with a validated method. We use sound statistical methods to compare the outcomes between the three groups. WHAT DO YOU THINK THE RESULT WOULD BE? Group 3 is not going to do very well; not only do they receive no therapy at all, but they are also disappointed to have ended up in this group as they joined the study in the hope to get acupuncture. Therefore, they will (claim to) feel a lot of pain. Group 2 will be pleased to receive some treatment. However, during the course of the 6 weeks, they will get more and more suspicious. As they were told during the process of obtaining informed consent that the trial entails treating some patients with a sham/placebo, they are bound to ask themselves whether they ended up in this group. They will see the short needles and the shallow needling, and a percentage of patients from this group will doubtlessly suspect that they are getting the sham treatment. The doubters will not show a powerful placebo response. Therefore, the average pain scores in this group will decrease – but only a little. Group 1 will also be pleased to receive some treatment. As the therapists cannot be blinded, they will do their best to meet the high expectations of their patients. Consequently, they will benefit fully from the placebo effect of the intervention and the pain score of this group will decrease significantly. So, now we can surely predict the most likely result of this trial without even conducting it. Assuming that acupuncture is a placebo-therapy, as many people do, we now see that group 3 will suffer the most pain. In comparison, groups 1 and 2 will show better outcomes. Of course, the main question is, how do groups 1 and 2 compare to each other? After all, we designed our sham-controlled trial in order to answer exactly this issue: is acupuncture more than a placebo? As pointed out above, some patients in group 2 would have become suspicious and therefore would not have experienced the full placebo-response. This means that, provided the sample sizes are sufficiently large, there should be a significant difference between these two groups favouring real acupuncture over sham. In other words, our trial will conclude that acupuncture is better than placebo, even if acupuncture is a placebo. THANK YOU FOR DOING THIS THOUGHT EXPERIMENT WITH ME. Now I can tell you that it has a very real basis. The leading medical journal, JAMA, just published such a study and, to make matters worse, the trial was even sponsored by one of the most prestigious funding agencies: the NIH. Do you see how easy it is to deceive (almost) everyone with a trial that looks rigorous to (almost) everyone? My lesson from all this is as follows: whether consciously or unconsciously, SCAM-researchers often build into their trials more or less well-hidden little loopholes that ensure they generate a positive outcome. Thus even a placebo can appear to be effective. They are true masters of producing false-positive findings which later become part of a meta-analysis which is, of course, equally false-positive. It is a great shame, in my view, that even top journals (in the above case JAMA) and prestigious funders (in the above case the NIH) cannot (or want not to?) see behind this type of trickery. Why are alternative practitioners so stubborn? Why do most alternative practitioners show such dogged determination not to change their view of the efficacy of their therapy, even if good evidence shows that it is a placebo? This is the question that I have been pondering for some time. I have seen many doctors change their mind about this or that treatment in the light of new evidence. In fact, I have not seen one who has not done so at some stage. Yet I have never seen an alternative therapist change his/her mind about his/her alternative therapy. Why is that? because they need to earn a living. All of these reasons may apply. But do they really tell the whole story? While contemplating about this question, I thought of something that had previously not been entirely clear to me: they simply KNOW that the evidence MUST be wrong. Consider an acupuncturist (I could have chosen almost any other type of alternative practitioner) who has many years of experience. He has grown to be a well-respected expert in the world of acupuncture. He sits on various committees and has advised important institutions. He knows the literature and has treated thousands of patients. This experience has taught him one thing for sure: his patients do benefit from his treatment. He has seen it happening too many times; it cannot be a coincidence. Acupuncture works, no question about it. And this is also what the studies tell him. Even the most sceptical scientist cannot deny the fact that patients do get better after acupuncture. So, what is the problem? The problem is that sceptics say that this is due to a placebo effect, and many studies seem to confirm this to be true. Yet, our acupuncturist completely dismisses the placebo explanation. Because he has heavily invested in their therapy? Perhaps. Because acupuncture has ‘stood the test of time’? Perhaps. Because he believes what he has been taught? Perhaps. Because he is deluded, not very bright, etc.? Perhaps. Because he needs to earn a living? Perhaps. He has only ever treated his patients with acupuncture. He has therefore no experience of real medicine, or other therapeutic options. He has no perspective. Therefore, he does not know that patients often get better, even if they receive an ineffective treatment, even if they receive no treatment, and even if they receive a harmful treatment. Every improvement he notes in his patients, he relates to his acupuncture. Our acupuncturist never had the opportunity to learn to doubt cause and effect in his clinical routine. He never had to question the benefits of acupuncture. He never had to select from a pool of therapies the optimal one, because he only ever used acupuncture. It is this lack of experience that never led him to think critically about acupuncture. He is in a similar situation as physicians were 200 years ago; they only (mainly) had blood-letting, and because some patients improved with it, they had no reason to doubt it. He only ever saw his successes (not that all his patients improved, but those who did not, did not return). He simply KNOWS that acupuncture works, because his own, very limited experience never forced him to consider anything else. And because he KNOWS, the evidence that does not agree with his knowledge MUST be wrong. I am of course exaggerating and simplifying in order to make a point. And please don’t get me wrong. I am not saying that doctors cannot be stubborn. And I am not saying that all alternative practitioners have such limited experience and are unable to change their mind in the light of new evidence. However, I am trying to say that many alternative practitioners have a limited perspective and therefore find it impossible to be critical about their own practice. If I am right, there would be an easy (and entirely alternative) cure to remedy this situation. 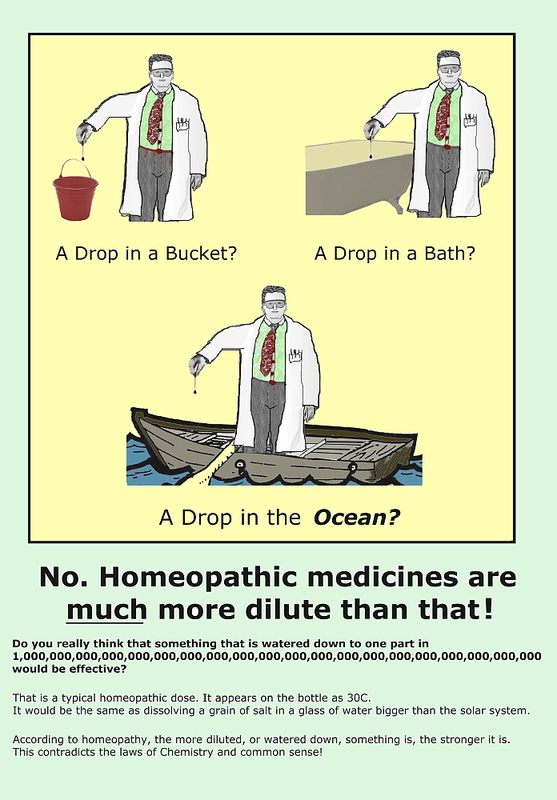 We should sent our acupuncturist to a homeopath (or any other alternative practitioner whose practice he assumes to be entirely bogus) and ask him to watch what kind of therapeutic success the homeopath is generating. The acupuncturist would soon see that it is very similar to his own. 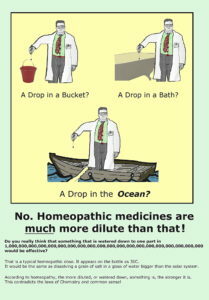 He would then have the choice to agree that highly diluted homeopathic remedies are effective in curing illness, or that the homeopath relies on the same phenomenon as his own practice: placebo. Sadly, this is not going to happen, is it?